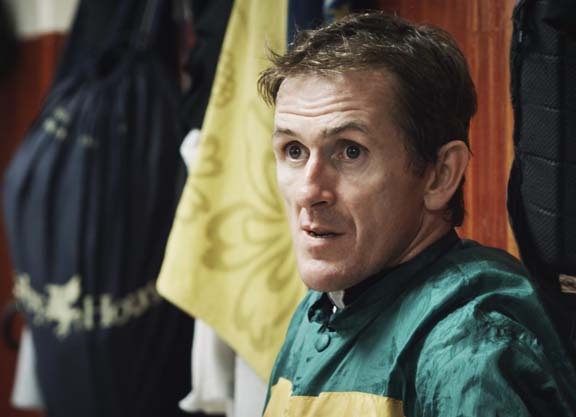 This brief commentary on McCoy’s singular vision–just win, baby–sums up an outstanding film from director Anthony Wonke that follows McCoy through what winds up being his final season as a professional jockey. It’s compelling stuff. McCoy, now 42, is a serious, taciturn man who makes no attempt to sweeten his countenance for the cameras. And in a movie with no narrator, no backstory, and no explanation of the racing world, it is McCoy’s driven personality that keeps things moving forward. For those unfamiliar with the feats of the Northern Irishman, McCoy dominated his sport in a way that few other athletes can claim in their respective endeavors. For 20 straight years, McCoy was crowned champion jockey in Ireland and the UK. He oftentimes led his rivals by huge margins. This in a sport where a jockey is unseated from his mount on the average of once every 12 rides. That means McCoy fell, and faced the prospect of serious injury, over 700 times. Last December, the Racing Post called McCoy the greatest jump rider in history, noting his, “three epoch-making records–most wins in a career (4,348), most wins in a season (290), and the greatest number of championships.” In 2010, McCoy became the only jockey to be named the BBC Sports Personality of the Year. McCoy’s relationships have suffered, too, most notably with wife Chanelle. One doesn’t achieve what McCoy did without remarkable self-absorption at times, and any viewer that has sacrificed greatly for a loved one will relate to Chanelle. The result of it all is a documentary that should appeal to anyone, fans of racing or not, interested in the sometimes joyless pursuit of success. To be sure, Being AP is a study in the fear of failure, a celebration of sacrifice. Last month, Being AP was released online for the first time (www.beingap.com/shop), and the TDN chatted with Nick Ryle, co-producer of the project, about the unique figure who in June became only the second jockey to have been knighted by The Queen, after Sir Gordon Richards in 1953. TDN: Being AP takes a hard, honest look at what got A.P. where he is, in particular the sacrifices that both he and Chanelle had to make. RYLE: Yes, and I think that comes through particularly at the end. He has asked everybody else to go through an awful lot, while he’s been able to have this 100% single-minded pursuit of this one thing. There’s that rather moving bit, where it’s sort of dawning on him, and he says, “I was very lucky. I was very lucky that she stuck with me.” That’s the last thing we recorded, actually. That voice at the end was recorded two weeks after his retirement. We just wanted to get him post retirement, and he started talking about things he had never talked about before. TDN: Going in, did you expect Chanelle would play such a pivotal role in the film? TDN: One of the reasons why the film works is that A.P. isn’t blindly celebrated. Even as you root for him and are in awe of what he’s doing, he can come off as an unsympathetic character. RYLE: He comes across as he is. He’s genuinely a hard man, but he’s got a confidence in his stature. He will do what he needs to do, and he’s the top gun. And he’s sort of proud of that. He knows that that’s who he had to be to be champion jockey 20 times. That’s what he’s the most proud of it. So he does come off as grumpy and selfish and not a particularly nice guy, but that’s how he is. TDN: Was there ever a worry about how he’d receive the movie? TDN: Is there a scene that, for you, encapsulates the film? TDN: Strictly as a piece of art, it’s a visually striking film. The cinematography is spectacular. RYLE: One of the things about racing is that you don’t quite know where the story is going to be–you have to be very flexible–so there were about three [cinematographers] we used. The really good stuff was shot by a young guy named Tom Elliot. There’s one shot, every time I watch it, I wonder how on earth he’s done it. It’s head on, and he’s probably on AP for two furlongs and never loses focus with a long lens. That is some feat–an unbelievable piece of cinematography. TDN: The access the crew got was impressive. How much footage did you film? RYLE: We filmed 180 hours…for an hour and half film. TDN: The film’s been out in Britain since late last year, and was screened at select locations in the U.S. this summer. How has the response been? RYLE: What’s been great is that people in racing have really enjoyed this film. That was very important to me, and I know it was very important to AP. Regardless of any wider success, the real racing aficionados enjoyed this film and didn’t feel in any way that it misrepresented the sport, or was condescending.